A few years ago, I had the fortune of visiting Paris for the first time. When I begun planning my to-do list, I knew a trip to the hip boutique Colette was a must. 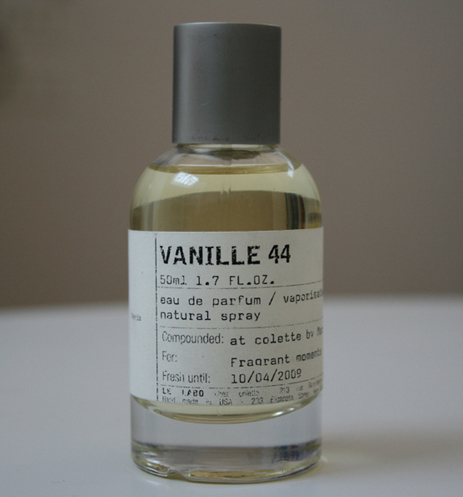 At that time, it was the only place anyone could get their hands on Le Labo’s Vanille 44. After Labo’s Rose 31 made me a fan for life, the thought of snagging something I couldn’t get in NYC was thrilling. I don’t collect sneakers or much else, so this is my participation in the collector’s fanaticism thing. Le Labo is finally opening a Paris boutique and to celebrate this occasion, they are selling Vanille 44 online for one month only. If you’re thinking Vanilla is for girls, think again. This isn’t your typical vanilla scent. It’s darker with wonderful richness. It wears close to the skin and man as it dries down; it develops a woody character sprinkled with just the right amount of sweetness. It’s become my rainy day go-to scent and I’m glad it’s a part of my growing collection. Get yours here. This entry was posted in News, Uncategorized and tagged Colette, Le Labo, men's cologne, Men's Scents, Vanille 44. Bookmark the permalink. Thanks for stopping by Natalie. I really appreciate it.